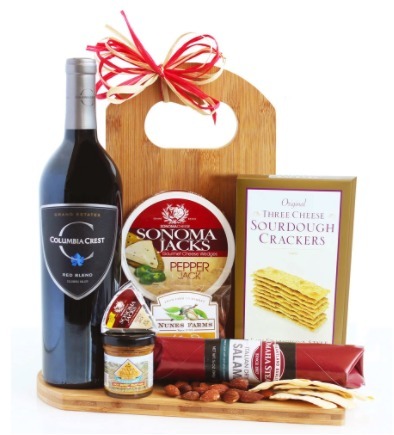 Sometimes you just need to add some wine – and that is what Wine.com uses as their inspiration for their gift baskets. These baskets center around the bottle and include things like gift towers, picnic-ready baskets and gifts for the hostess. With their excellent selection and always reasonable gifting prices, you might just find the ideal gift for someone you want to impress this year. 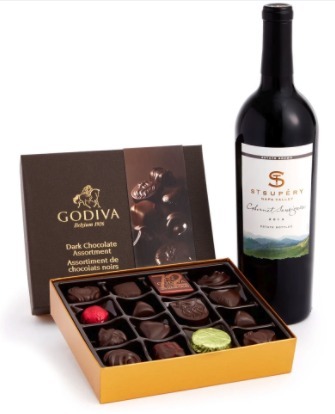 An online wine retailer that also offers exclusive wine gift baskets. Wine.com gift baskets all have wine – though you should have guessed that from the name. So, their variety may not be as robust as other gift basket retailers, but if you are in the market for a wine basket, they are the place to shop first. Their baskets still contain non-wine items, such as corkscrews, wine glasses, cheeses, wine accompaniments, cheese board sets, snacks, etc. 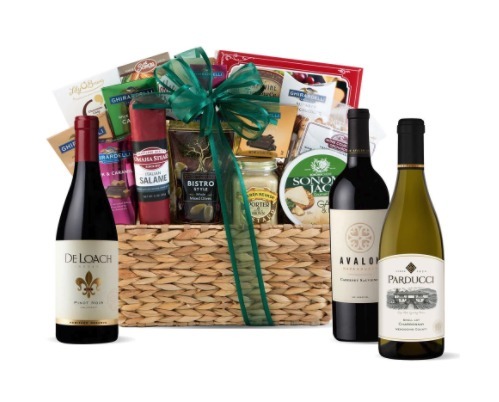 When it comes to brands for their wine baskets, they typically include Ghirardelli, Sonoma Jacks, Pepperwood, Godiva, Clos du Val, King Estate, Nunes Farms, Rainier Ridge and other popular Napa Valley wines. While they may not have as much variety as companies that specialize only in gift baskets, they offer the exact variety you would expect from a company specializing in wine-based gift baskets. Unfortunately Wine.com falls short on customization. You cannot add-on to a basket, swap out any items or create your own. That being said, they still have a large variety of baskets to choose from – so the customization may not be a big issue. Instead of the usual been-there-done-that type of theme, the baskets from Wine.com focus more on wine-centric occasions, such as picnics, cheese boards, etc. They do have some baskets in the usual sentiments, but they are more universal looking and can be used across the board for all. Some baskets are holiday themed and the inventory for those will vary depending on the time of year you’re shopping. They don’t carry gluten-free, organic, Kosher or vegan basket options at this time, but some can be applied to those categories. Wine.com does have a corporate buying department and you will call a 1-877 number in order to place your corporate gift. You can get assistance with placing your corporate orders, get customized gift ideas and even schedule orders in advance so that you can get a jumpstart on your shopping. They offer bottles, baskets and gift cards for corporate buyers and there are discounts for multiple orders. Wine.com will cost more than other gift basket merchants. Most baskets do not even start until $70 and the best baskets are over $150. That being said, they include higher quality products, fine wines (in full-sized bottles) and non-edible items like cheeseboards, wine glasses and picnic baskets. Not everyone can shop with Wine.com. Those that live in states that will not accept wine imports – such as Texas or Utah – will not be able to send their baskets to recipients in those areas. This is not necessarily Wine.com’s fault though – and most companies that sell wine or liquor products will be limited by the same regulation. The shipping isn’t as clear with Wine.com because it all depends on the zip code and the final weight of the wine gift basket you’re ordering. They do offer free shipping through their StewardShip, but this is a monthly membership you would need to pay $49 per year for. So unless you order often from Wine.com, it is more cost-effective to just pay for shipping. There are no last minute orders or same-day delivery options either with Wine.com and their unclear shipping costs can make it difficult for people to budget or plan. You can clearly see what items you will receive with each basket. Also, they give you the product information in detail format as well as their sizes. For gift baskets you will be able to add a personalized gift message during the checkout process. There is a multi-faceted return policy with Wine.com. If merchandise is damaged during shipping, they will replace the item that was damaged or process a refund for its cost. To return an unwanted item, you can as long as it is unopened. Items you are dissatisfied with will need to be reported to customer service and they can issue a credit to your account in most instances. If for some reason your gift basket is missing items, it may be because they had to do a last-minute substitution. But, if you are dissatisfied with their selection, you can return it and get a refund. Customer service isn’t as robust with Wine.com as other companies, but you can still reach them via toll-free number and email. They also have plenty of facts online that answer most questions. Customer service is available Monday through Friday only from 5am to 5pm PST. Wine.com is a BBB accredited business and they have been since 2004. Under $50 – There are no gift baskets under $50. $50 to $100 – Baskets in this price range still can include up to three bottles of wine, cheeses, snacks and more. $100 to $200 – The larger baskets are in this price range and some even include Dom Perignon, fine chocolates, etc. $200 and up – There are only a few baskets over $200 and those that are include up to four bottles of wine or a variety of champagnes, cheeses, chocolates, non-edible items, etc. Because of the inventory, Wine.com will really only apply to those that are shopping for baskets with wine and those centered around wine. For recipients in certain states, such as Florida, Idaho, Utah, New Hampshire, and Alaska, they will need to shop elsewhere as well – because Wine.com cannot ship to the dry zip codes. We like the collection of baskets and options with Wine.com. We really like how they throw in keepsake items – such as a corkscrew or wine glasses. The baskets are definitely of higher quality than your average vendor as well. The prices, considering the caliber of products in the basket, are very reasonable as well. We wish shipping rates were more universal so that buyers could better plan their shopping. Also, we hope to see some more gourmet food baskets. While they have a few, most are centered around wine and it would be nice to see a few without – especially when you consider their taste in food selection. Excellent wines and fine foods. 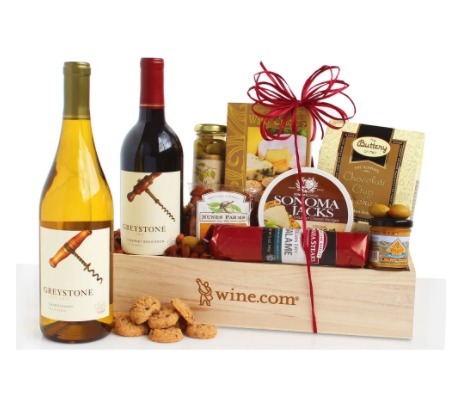 Wine.com has a fine collection of wine-centered gift baskets ideal for the gourmet, hostess or just to treat yourself. Under $50 - There are no gift baskets under $50. $50 to $100 - Baskets in this price range still can include up to three bottles of wine, cheeses, snacks and more. $100 to $200 - The larger baskets are in this price range and some even include Dom Perignon, fine chocolates, etc. $200 and up - There are only a few baskets over $200 and those that are include up to four bottles of wine or a variety of champagnes, cheeses, chocolates, non-edible items, etc.